What is it? It’s a most useful little thing: a low-cost diamond engraving attachment for the Eggbot. 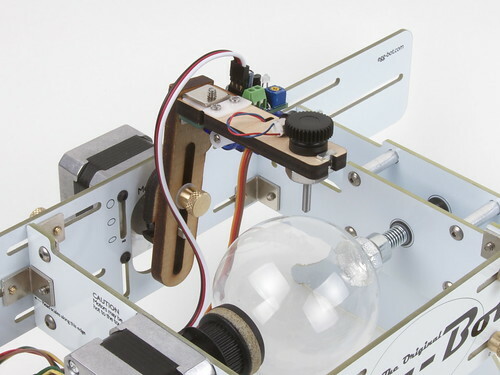 This turns a humble pen-plotting Eggbot into a full-on CNC-driven vibrated-tip diamond-point engraving tool, capable of light-duty marking and engraving on hard materials like glass, stone, and ceramic. Wooo! The engraving tip itself is a small single-point industrial diamond, mounted on a thin steel shaft, in a fixture that holds it where the pen would normally be. That fixture consists of a 3/8-16 nylon thumb screw, drilled out to fit the steel shaft, and a matching 3/8-16 hex nut that locks it in place. The place where the pen (or diamond fixture, in this case) mounts is at the end of the so-called “distal” pen arm. 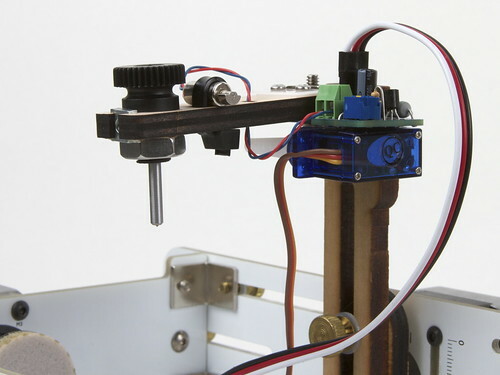 The distal pen arm is connected to the rest of the pen arm through a thin acetal flexure hinge that allows the “pen lift” servo motor to lift the pen off of the egg. That flexure hinge that allows the diamond to move up and down also provides the necessary degree of freedom for our engraving motor to work. There are any number of ways to engrave a hard surface. You could (for example) employ a rotating carbide burr, or move an otherwise stationary diamond point under pressure for “drag” engraving. The method that we use is to rapidly vibrate the diamond point up and down against the surface, like an angel dancing on the head of a pin– that happens to have a tiny jackhammer. The motor that provides that vibration is a high-RPM, 6 mm pager motor, attached tightly to the distal pen arm. 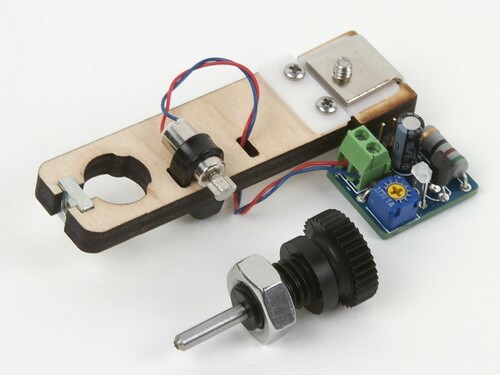 The motor is controlled by a little transistor driver board that takes its power from the EBB, the Eggbot’s controller board. When plotting with a pen, it’s usually preferable to let the pen lightly rest on the egg surface, so we use a fairly weak flexure hinge. But for engraving, it’s often helpful to apply some downward pressure onto the glass or stone surface, so we actually found that a thicker, stiffer hinge is better. The stiffer hinge also improves accuracy of engraving, by reducing the amount of twist-type motion possible for the pen arm. We’ve been working on developing this engraving technique for most of the last year. 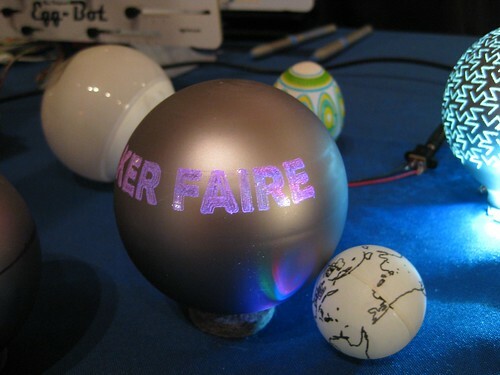 We demonstrated one of the early prototypes at Maker Faire Detroit— where we engraved “MAKER FAIRE” into a painted-glass christmas ornament, lit from within. 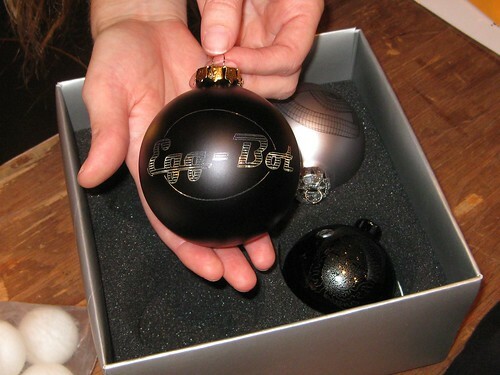 This ornament– silver inside, black paint outside –was engraved by original Eggbot inventor Bruce Shapiro, and shown off at Maker Faire NY. 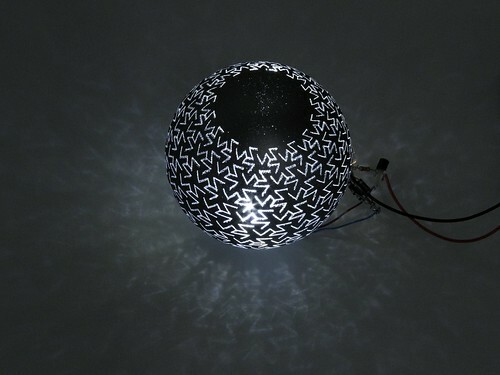 This is a white marble (stone) sphere, surface engraved with the diamond tool. One of the issues with engraving glass ornaments is that they are really thin and can break. On a solid stone sphere, there’s no such worry. And, as the material is softer, it engraves that much more readily. We haven’t begun to scratch the surface (groan allowed) of what the Eggbot Engraver tool can do. And, given everything else that people are doing with their Eggbots, we’re genuinely excited to see what people do with these. 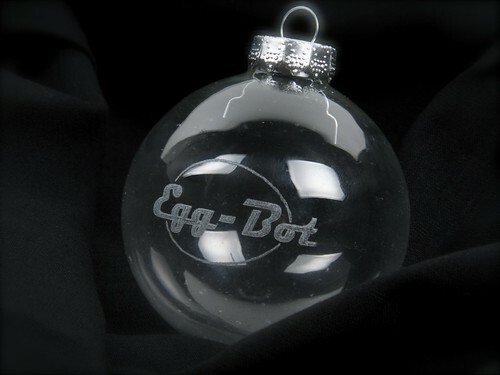 The Diamond Engraving Tool for Eggbot is available at our webstore, shop.evilmadscientist.com. This entry was posted in CNC, Eggbot, EMSL Projects, Evil Mad Scientist Shop and tagged cnc, eggbot, engraving. Bookmark the Permalink. Just wanted to say: that pun was amazing. Very cool, now if you guys would make a flat surface CNC diamond engraver kit that can engrave aluminium and route PCB’s that would be awesome.! I’d buy one in a flash. This particular engraver could be adapted to engrave anodized aluminum fairly easily. Routing PCBs, or "deep" engraving of aluminum is probably not possible with a vibrated tool like this, because you need to remove bulk material. I wonder how well the engraver would (or wouldn’t) work at "etching" PCB’s. If one could still hand-drill holes, but use an engraver to remove the unnecessary copper from a PCB, it might be a less caustic way to create PCBs if you were only prototyping, and didn’t need the surface to look "pretty" when you were done? I read the title and thought you miniaturized eggbot to engrave diamonds. It almost looks as if the dimond is one that is used to sharpen surface grinding wheels which are fairly inexpensive. … or the diamond engraving bit for a Dremmel. You could probably even use a diamond (or carbide) scriber. £12 in the UK. 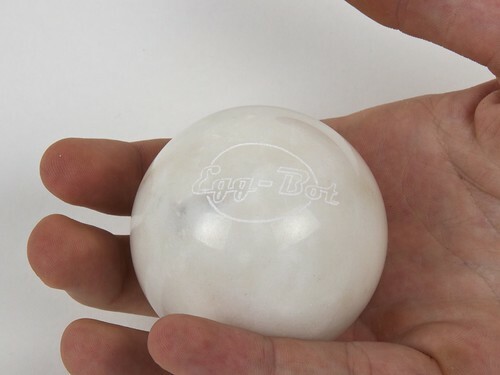 I haven’t seen that particular one, but a lightweight air-powered tool can work very well on an Eggbot.